Right now, I have a lot of triathletes I am working with on their Annual Training Plans and laying out their training and racing goals for the year. Pretty much everyone has been asking me about what they should or shouldn’t eat and when they should or shouldn’t eat it. So, let’s see if I can answer most people’s questions in one go. Big meals will often lead to over-eating, bloating, feelings of lethargy and sluggishness. Big meals are harder for your stomach to process and harder for your body to absorb all the nutrients you are feeding it. They are also sending your brain and body the message that every meal should be “super-sized” and you might end up only feeling satisfied when you over-eat. 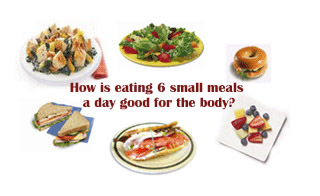 Small meals are easier to digest and absorb, and will leave you with less feeling of being bloated and sluggish. When you are training well and regularly, you will probably need to eat more to fuel your work-outs, so you should try to do that by eating more often in small quantities rather than eating much larger meals. Thirst is typically a sign of dehydration, which means if you wait until you are thirsty then you are already a little too late, and you’re playing a difficult game of catch-up. Once you are dehydrated, your blood is starting to get thicker, it is transporting nutrients around your body less efficiently, your muscles may be more likely to cramp up, your joints may be more likely to ache or swell. It takes time for that water to get into your system, and it is basically the same thing for food. Hunger is a sign of not having enough nutrition to fuel your activity. So try and think in advance and follow those rules above. It is hard to get it right all the time, and it will require that you really listen to your body, make small adjustments over the course of several months, perhaps years, in order to try and get it right more often. Hell, go for 9 portions a day, just to be sure. Honestly, how many of you out there eat enough fruits and vegetables, anyway? How many of you think that ketchup on your fries counts as 2 portions of veg? Sorry, potatoes don’t count, and you knew ketchup didn’t count, either. And fruit juices made from concentrate don’t count. And jam on your toast or an apple pastry doesn’t count. Smoothies, they’re pretty good. Dried fruit is not bad (but, be careful, a lot of them have a lot of added sugar). Salads are great. Soups can be good (again, be careful as many prepared soups have a lot of added salt). Of course, fresh fruits and vegetables are the best. Carrots as a snack, celery, cut-up pieces of broccoli, cauliflower, or other raw vegetables are really, really good. Cooking vegetables, unfortunately, does drain some of the nutrients out of them, but they are better than not eating any vegetables. If there are any “paleo diet” people out there, I’m not going to get into the whole murky business of carbohydrates with you. My understanding and personal experience is that carbs are an important food group and you need them in your diet, especially if you are training regularly. Whether you agree with that statement or not, at least we can probably agree that the less processed a carb is, the better it is for you. Less processed carbohydrates will be slower-burning, have less of an insulin spike associated with them, and have a little more of the other things you need, like fibre, vitamins, minerals and protein. So, brown rice is better than white rice, wholemeal/wholegrain breads are better than white breads, wholewheat pasta is better than the more processed pasta. Sometimes the differences aren’t huge, but usually they’re noticeable. But, remember, just because it looks brown doesn’t mean it’s always better for you – some brown bread is often just white bread with something added to change the color, so look for wholemeal and whole grain breads, not just brown bread. Brown sugar is often just white sugar with molasses added to it, so just don’t put so damn much sugar in your coffee or on top of your healthy Weetabix/Shredded Wheat/muesli/oatmeal/yogurt. Probably the leanest sources of proteins (depending on how you cook and eat them) will be vegetable-based proteins like soy beans, legumes, nuts, seeds, pulses and other types of grains (quinoa, for example) not mentioned in the carb section above. Dairy is a pretty good way to get protein, too, with even whole milk only containing 4% fat (watch those fatty cheeses, though). Tuna is a very lean source of protein, depending on how you eat it (not if it is drenched in mayonnaise in a tuna salad, for example). Chicken and turkey are good, too. Lean cuts of beef, pork and lamb are good, too, and contain other vital nutrients, so don’t interpret all this as me telling you to go and become a vegetarian (or one of those infuriating people who say they’re vegetarian, but eat chicken and fish…?!?!?). Just look more closely at what you buy. Some sausages, for example are only 45% meat, while others are 85% meat. Some ground beef contains 22% fat (chuck), but some only has 5% fat (sirloin). Read more labels. If you are careful about what you eat 85% of the time (say, roughly, 6 days out of every 7), then you can cut yourself some slack the other 15% of the time. Food is enjoyable, food is fun. Every great culture has acknowledged the importance of food in social interaction, celebration and the enjoyment of life. So, enjoy your food, but don’t mindlessly stuff it down until you can’t possibly stuff any more in. And think about it a little more, but don’t obsess over it all the time, either. With all these tips here I am certainly not saying that you should be a purist or a health nut. I think you’ll find that these tips I have given you are mostly common-sense tips, nothing terribly dramatic required of you to follow them and get yourself on the way towards eating well and fueling yourself properly for good exercise and training routines.